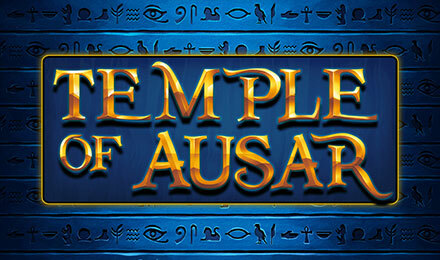 Temple of Ausar slots is a colourful Egyptian themed slot game that enables you to profit from Free Spins, Gamble Features and high paying symbols. Plastered with 5 reels and 25 paylines, Temple of Ausar slots is beautifully crafted and built to provide you with the best entertainment. Let the music open the game for you, where you can place your bets as from £0.01 to a maximum of £12.50. The Wild and highest paying symbol of the game is the God, Ausar. For landing a combination of five symbols, you will receive winnings of 9,500 coins! You will be happy to know that the game also has the Free Spins Feature which can be triggered. When activated, the game will kick off with 15 free spins where all wins generated will be multiplied by 3.